Before I start with the real business of this post I wanted to let you all know that I will, from here on out, refer to my husband as "Duff Man." I know that he'd prefer that I not use his name in my posts, but I hate using the term "my husband." Also, my husband looks a bit like Duff Man (blonde, muscular, wears sunglasses frequently), is a big fan of "The Simpsons," and likes to stink up my house with his home brews. I thought the name was rather fitting. My husband is Duff Man. Oh yeah! Duff Man's birthday was earlier on August. His birthday fell on a Wednesday, so we decided that I would make him dinner on his birthday itself and that we'd go out to dinner on Friday or Saturday. His also requested that one dinner would be Italian and the other Mexican, but he didn't care which was home made and which was at a restaurant. On Wednesday, I made Duff Man a dinner of Chicken Enchiladas Verdes and using fresh roasted tomatillos and jalapenos with a side of Mexican Rice. 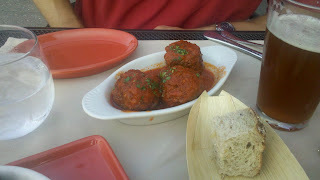 On Friday evening, we ate at Dino in Cleveland Park. I chose it because it was listed among the best Italian Restaurants in the DC area by both OpenTable and the Washington Post Going Out Guide. Our reservation was at 7:15pm on a Friday evening. We found street parking pretty easily and were seated right away. The weather was gorgeous, so we decided to sit out on the patio. I thought it was odd that they chose to seat us at a table that was severely slanted because of the angle of the sidewalk, while there were two available tables on perfectly flat ground right next to it. When our waiter dropped off my drink and told me I should probably take a sip so it didn't spill, we asked to move to one of the flatter tables instead. Duff Man and I decided to try the 3-Course Dinner Special ($39/person). The first course could be any antipasti or half pasta; the second course could be any pasta or secondi, and for the third you could choose either a cheese course or one of their desserts. These really were little kisses of awesomeness. I wish I'd though to use the bread to mop up the delicious sauce before the server took the dish away! 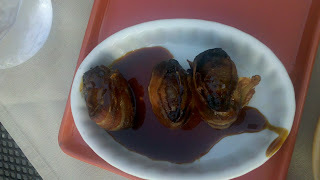 Definitely try these if you ever go to Dino! Because Dino makes all of their pastas in house, both of us decided to stick with pasta for the secondi. 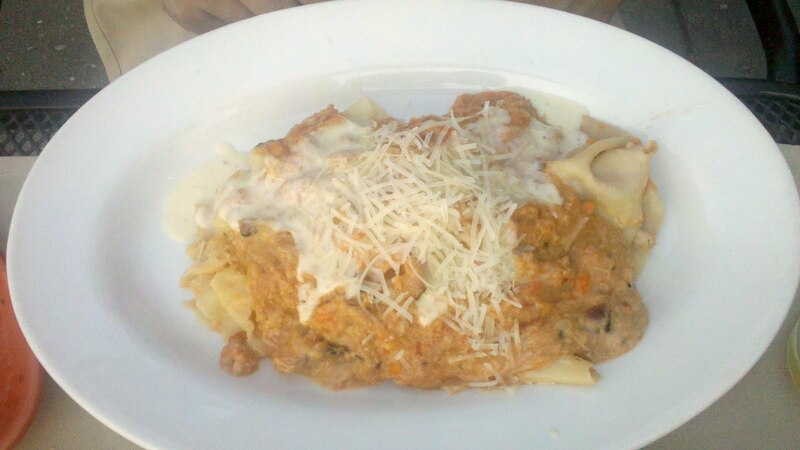 Besides, why would Duff Man request an Italian restaurant for his birthday dinner and NOT end up getting pasta? This was interesting. Instead of being served as a traditional lasagna, it was more like pappardelle dressed like lasagna. The dish was really flavorful, but so rich that I wouldn't have been able to eat more than a few bites. Duff Man, however, polished the whole thing off. This dish was something special. 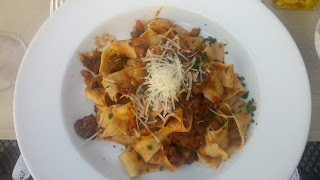 The fresh pasta was perfectly al dente, and the sauce was deep and complex. It was delicious and fulfilling without being heavy. Loved this! 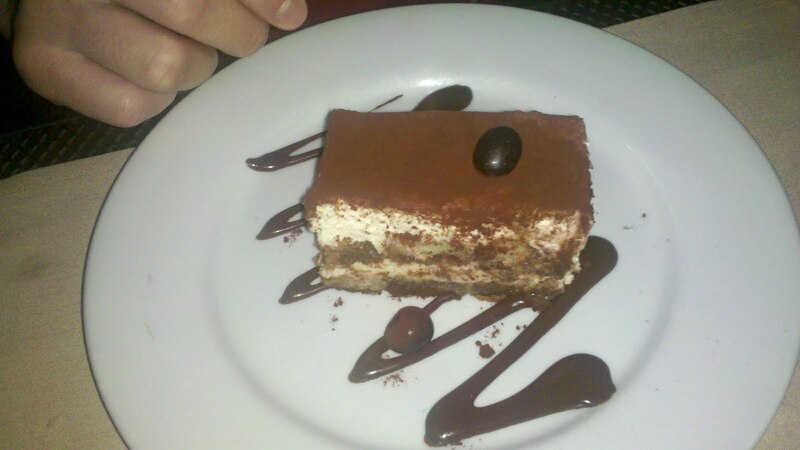 This was a pretty standard tiramisu--not bad, but nothing outstanding. 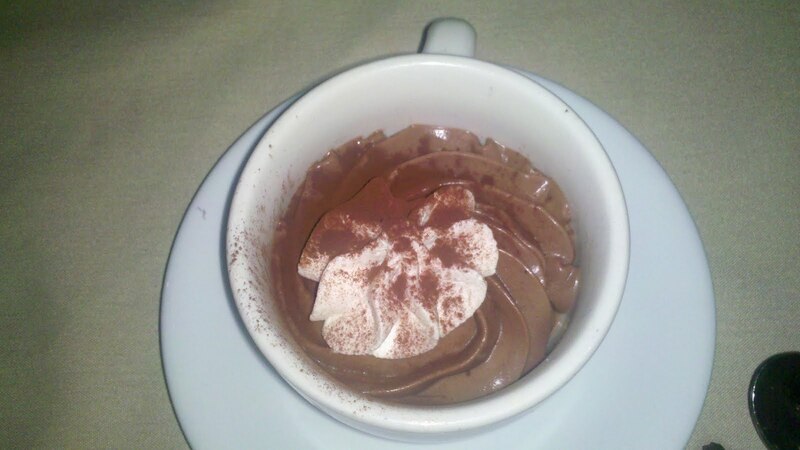 But then again, when is tiramisu ever bad? Nutella + Mascarpone should be a sin. This was rich and creamy and amazing. Please excuse me while I catch my breath and then say 10 "Hail Mary"s for penance. Overall, Duff Man and I had a good experience at Dino. The food was definitely the highlight--very fresh and flavorful and reasonably priced. The weather was beautiful and we enjoyed our (non-tilted) patio seating. The menu also offers lots of gluten-free options; in fact, it lists which items are gluten free, which ones aren't but can be made gf, and which ones cannot be made gf. That said, our server wasn't the most attentive person (we had to wait a long time for our water to be refilled, and our check came with an error on it.) Also, I would caution anyone dining there to calculate the cost of your meal before deciding to take the $39 3-course-meal option; if you add up the cost of our meals, it actually should have come to less than $39 (although apparently it was supposed to come with a complimentary glass of cello or moscato--which would have made up the difference.) I would definitely go back, given another opportunity!